We were returning to Bangkog after 10 years so we were both anxious to see if the city has changed and if our perception of the place has changed after visiting so many other places. This time we were only stopping for 2 days hoping to return again at the end of our trip before coming back to London. The first day after a tiring trip from Bali, as unfortunately we were routed via Kuala Lumpur and Singapore and the journey instead of a few hours took almost a day, was spent organizing the rest of hour, catching up on some sleep a visit to the gym and exploring the local busy area of Sukhumvit Road. In the evening we ventured for a Thai dinner to a roadside restaurant, but unfortunately we were not brave enough to try the local delicacy of some worms and beetles and settled for a prawn curry and some Pad Thai. 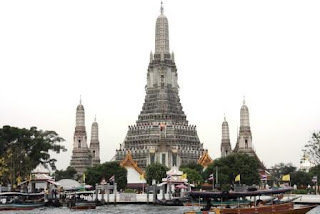 ...we headed for the Grand Palace – 1 sq km ground encompasses over 100 buildings. The Wat structures are extremely colourful with orange and green roofs, mosaic encrusted pillars and rich marble pediments. and the Wat Phra Kaew temple with emerald Buddha – 75cm tall statue, one of the most important statues of Buddha in Thailand. The Buddha has 3 wardrobes, one for each season, warm, cold and rainy that is changed by the king himself at the beginning of each season. The Grand Palace and Wat Phra Kaew turned out to me as spectacular as we had remembered them. After a short break for a quick drink at the local market we headed for the sight of the reclining Buddha at Wat Pho. The Wat Pho is one of the oldest temples in Bangkok and hosts and enormous statue of a Buddha covered in gold (46m long, 15m high). After a tiring day we relaxed with a traditional Thai massage at the Wat Pho temple. A visit to Bangkok wouldn’t be complete without a short visit to the backpackers Mecca of the Khao San Road. In the evening we headed for some shopping and a dinner to the Night Bazaar next to the Lumpini Boxing Stadium. The short visit to Bangkok came to an end and the next morning it was already time to get back to the airport for a short flight to the Northern Thailand town of Chiang Mai. Bangkok hasn’t changed that much since our last visit 10 years ago and is as busy and as exciting as ever. The only difference is that it has become a bit more up market and expensive with many new hotels and big brand shops with European prices centered particularly around the Siam Square area. The buildings are so amazing and with a very beautiful design. Not to mention the photos you have taken from the villages. I am sure that you have great time there and it will be difficult to come back. Enjoy the holidays. Cambodia - Angkor temple where they film Tomb Rider and then couple of weeks on the beach - but we probably won't come back as brown as you from Greece. It will be hard to be back - I'm petrified of the moment we land at Heathrow.